CANTON, Ohio, March 12, 2018 (SEND2PRESS NEWSWIRE) — SprayWorks Equipment Group, a spray foam and coatings equipment company, has launched a new video series for contractors. The new series of short videos, aptly named “Fix-It Friday,” is hosted by polyurethane equipment experts with decades of experience: John Davidson and Dave Penta. 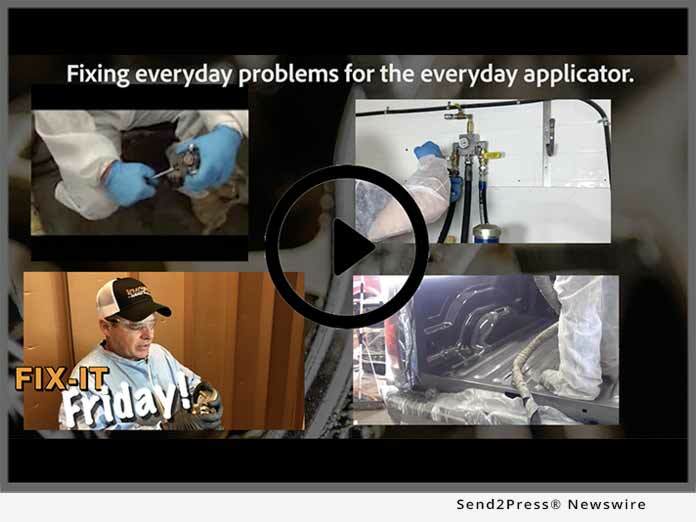 Fix-It Friday consists of monthly videos curated with common part repairs and maintenance steps that need to take place regularly. The videos allow spray foam contractors to take repairs into their own hands. Fix-It Friday videos not only make repairs easy to understand, but also breaks down the anatomy of equipment. SprayWorks’ first video repairs a smashed spring and bumper on a GHO Transfer Pump – an easy repair that needs to be fixed at times. Contractors can expect to see future videos such as; replacing o-rings, lubricating and servicing equipment, and other common repairs needing to take place in spray foam rigs and coatings rigs. SprayWorks Equipment Group is a spray foam and polyurea company; supplying equipment, training, material, mobile rigs, and parts – and the #1 distributor for PMC equipment. With nearly 100 years of combined experience, SprayWorks has knowledge in commercial and residential buildings, bridges, and infrastructure. SprayWorks provides training and education for new contractors and equipment operators; open cell, closed cell, polyurea & coating applications for interior & exterior building envelope design, waterproofing, below grade, bridge deck, barge, secondary containment all types of roofs and structures. For more information, visit: https://store.sprayworksequipment.com/ or https://www.youtube.com/user/SprayWorks or call 330-587-4141. Fix-It Friday! How to replace a GHO Transfer Pump Spring – for Graco, IPM, and PMC pumps? "Fix-It Friday is an exciting step for our entire team," says John Davidson, VP of Operations. "Each video includes common things that we fix regularly, and we break it down to make repairs quick which leaves the spray foam contractor feeling confident." SprayWorks Equipment Group LLC is a spray foam and polyurea company; supplying equipment, training, material, mobile rigs, and parts - and the #1 distributor for PMC equipment. With nearly 100 years of combined experience, SprayWorks has knowledge in commercial and residential buildings, bridges, and infrastructure.